Bear just isn't in the mood to play with Bug. She lumbers off to her cave for a nap but Bug buzzes after her as he thinks they are playing 'chase'! Bad-tempered Bear gets increasingly huffy and decides to hide from Bug instead. Of course Bug finds her and thinks it's an invitation to play hide-and-seek. And so it goes on. Each time Bear tries to shake off Bug, Bug - in his enthusiasm to play - gets the wrong end of the stick, and so each time adds to Bear's exasperation. Then Bear snaps. She tells Bug to go away and finally she gets to have her nap. But Bear feels bad for being mean so she comes back out of her cave to look for Bug and finds him floating and forlorn on a water-lily pad. Bear wades out into the lake and brings Bug back to the shore. 'You are my very best friend. Would you like to play now?' said Bear. 'I'm too tired to play,' said Bug, shaking the water from his wings. 'I think I'd like to have a nap.' And so they did. Together. 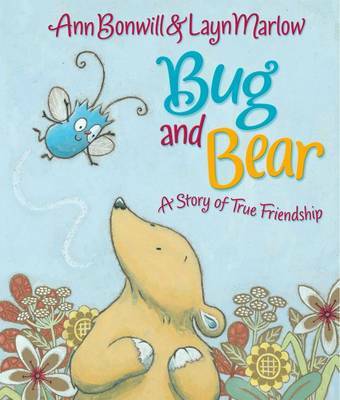 A story that celebrates the resilience of real friendship - this is an important and reassuring truth for children to know from the earliest age. A lovely book about friendship. My little one borrowed it from nursery and loved it so much she got her own copy using xmas book tokens!